We are leading pump manufacturer having an installation base of various engineering, chemicals, oil and petrochemicals and other allied industries in Indian and overseas market for 30 years. Our products have been recognized and accredited, certified by ISO 9001:2008. 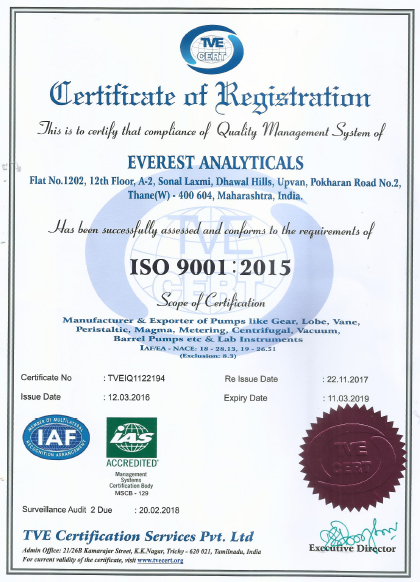 Everest analyticals is a company engaged in manufacturing and supplying various types of pumps. Our company is equipped with state of art manufacturing unit along with modern tool room facilities as par with international standard. We offer positive displacement pumps with range of capacities such as Lobe Pumps, Magma Pumps, Centrifugal Pumps, Gear Pumps, Vane Pumps, Plunger/ Diaphragm Type Metering Pumps, Chemical Dosing Pumps, Oil Filled Vacuum Pumps, Oil Free Vacuum Pumps, Barrel Pumps, Peristaltic Pumps, etc. Our office and factory based in Thane, Mumbai, India and catered business not only limiting to indian engineering sector but also spread over various other surrounding countries like Dubai, Indonesia, Mauritius, Singapore etc. With the growing market demand and escalating economy, we have taken position to cater the market of developed countries like US, Canada/ UK and other European countries. All everest products are offered with warranty & performance to match your applications. We offer you optimum solutions for liquid transfer and quality control. Our company is backed with state-of-the-art manufacturing unit and tool room, fully equipped with all the modern machinery and equipments. We Keep on upgrading the standard of our machinery that proves to be extremely beneficial in manufacturing products that can match the international quality standards. We keep check on quality of our products right from the first stage of procuring raw materials to the final stage of delivering products to clients. We Do inspect our manufacturing unit on regular intervals along with that we conduct maintenance programs for maintaining and conditioning our Machinery. We also follow various quality control mechanisms for ensuring flawlessness in our products.